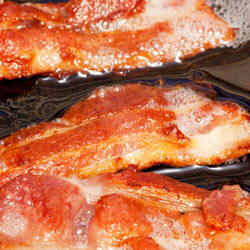 Some juicy ideas for beautiful bacon. Smoky, salty bacon. My mouth waters at the thought of eating it right out of the pan on Saturday mornings in crispy, delicious bites. It’s not only the perfect breakfast that it’s made for, there are oodles of fantastic dishes from simple to fancy to make with the heavenly stuff. A great flavour combination for a delicious plate of pasta. Remember to make extra for those cheeky seconds. This is quick and really comforting. Mop it up with slices of thick, crusty, warm bread and gorge-yourself for lunch or dinner. An eye-rollingly delicious meal in minutes. The sweet and salty combination just bursts with flavour and will delight your senses.